Welcome to my back porch! This little room is truly all mine. No one in my family ever had any interest in spending time here…even when there was a TV. So over the years I have changed the fabrics and accessories to reflect whatever decorating phase I was in at the moment. It’s been black and white toile, Lilly Pulitzer-inspired pink and green, and recently blue and white. It’s only been in the past five or six years that I have truly figured out my personal style. 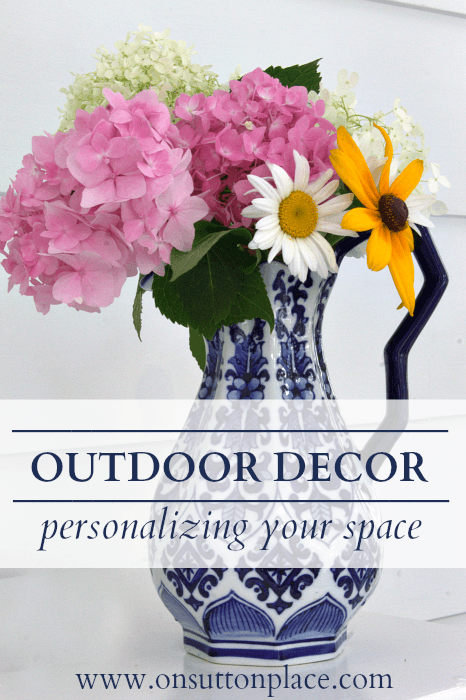 Outdoor decor is a great place to start if you want to experiment with personalizing your space. Begin with a neutral background and see what works…and what doesn’t. My personal style is a mixed bag of classic, vintage and farmhouse. Inside I have formal, dark wood pieces that live with inexpensive items from IKEA. Vintage ironstone and enamelware are used alongside heirloom silver. If I love something, I make it work in my space. So naturally, these same things are reflected in the outdoor decor of my back porch. The combination of blue and white is one of the most widely-used and loved color schemes. I have always had blue in my home. The very first sofa we purchased was navy blue with tiny little red dots. I adored it. Even though my main pieces are now mostly neutral, I still love a punch of color somewhere. For my porch, I got that from these incredible rugs from Oriental Weavers. This room is long and narrow so I used two 5 x 8 rugs and laid them end to end. The minute I had them in place I knew I absolutely LOVED them! With the rugs down, I was able to use most of the existing accessories to put the porch together. The only changes I made were the new white valances and I recovered the wicker sofa cushions with vintage white matelasse. One question that is asked quite often is what I do when it rains and the honest answer is that I don’t worry about it. Yes…things get wet. They also quickly dry out and I’ve never had anything ruined. A ceiling fan is really helpful to dry out the fabrics after a rain. 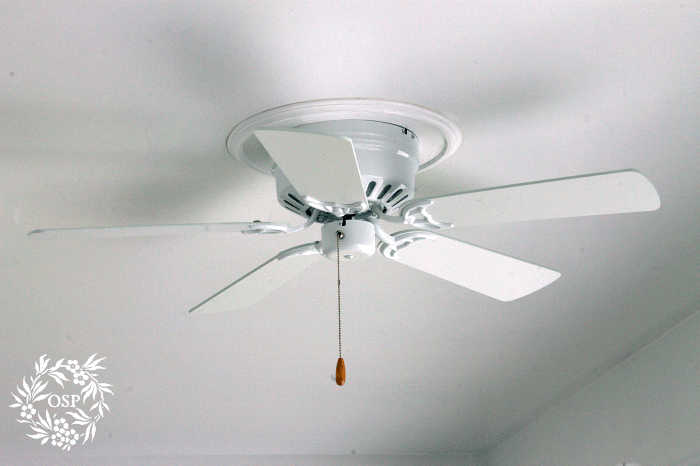 For years I put up with a noisy, rusted fan with wonky blades. Thankfully that fan is long gone and in it’s place is this beauty from Minka Aire. 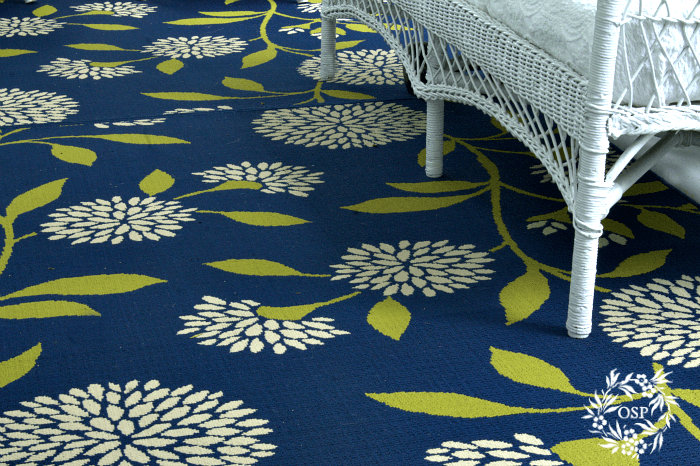 In all my rooms, including my outdoor spaces, fabric plays a major roll. For this look (and it may change any minute!) I’ve used inexpensive IKEA pillow covers, vintage grain sack and chevron. What makes it work is the color scheme. Everything is blue and white. I may add a pop of green but for now this is it. Of course we all have our own special way of decorating a space. Your personal style should be reflected in your decor, both inside and out. Finding that style is as simple as collecting what you love and adding it to your decor. Every so often when I post my decor here on the blog my daughter will say “It’s very you.” To me, that is the best compliment ever. Beautiful porch! I know you must enjoy your time spent there. Love the colours you used. The rugs add a nice amount of detail and pattern. I used navy and white in my family room as well, although the green is more of a soft gray-green than a fresh apple green, but I love the look of yours too. I bet you enjoy sitting on your porch. 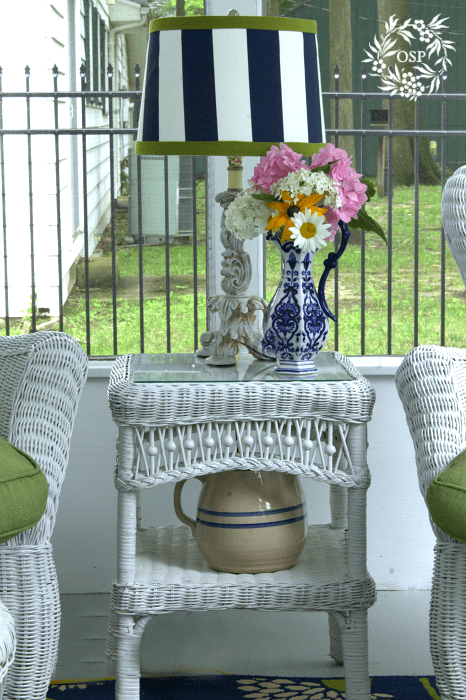 Your porch has always been one of my faves, Ann! I love its new look … the rug is awesome, and the IKEA pillow covers are fabulous! Yay for the new ceiling fan, too! Your porch is beautiful. I love your dog. The cutest little personality. Absolutely beautiful porch. 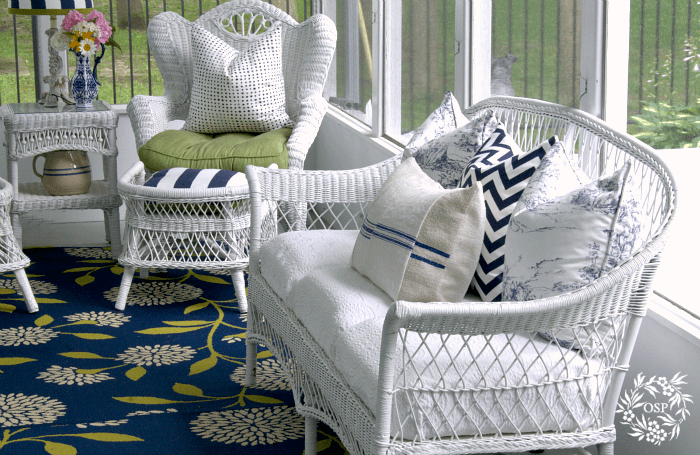 Blue and white…..my favorite, and I love, love, love the wicker! It’s a very inviting space. Ann, your style is very appealing……great job! Looks great Ann, Loving the striped lamp shade! I love it, Ann! The rug is colorful and so refreshing with your bold stripes and chevron. You have impeccable taste! Thanks for sharing your lovely porch hang-out. 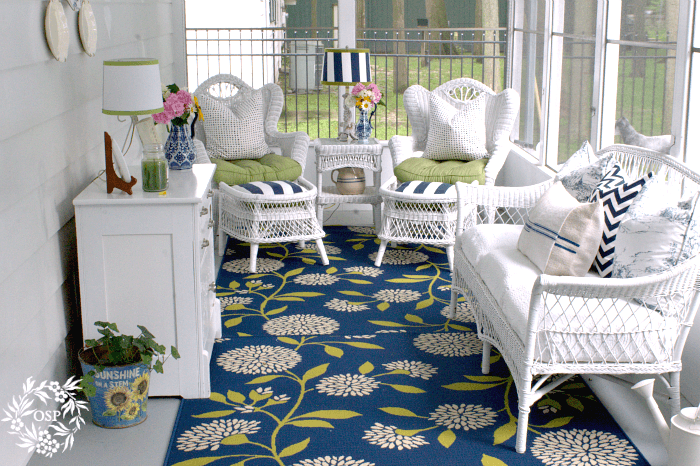 Ann, how clever to put the two rugs together to create such an impact on your porch! It all looks so fresh and lovely. Wish I could change my color scheme on our porch, but I can’t change the cushions or the outdoor carpet this year. New curtains are in the works, though! It’s so pretty, Ann! I used to have blue and white in my old apartment, but none in my house now. I kind of miss it, seeing how pretty yours is! Please move next door to me! (Please) You are so creative, and inspiring. I am always in awe of your decorating, sewing and…….everything . Enjoying your blog! Absolutely love it all! Your style is my style. I like a bit of a mix also as that style does seem to bring a very inviting look. 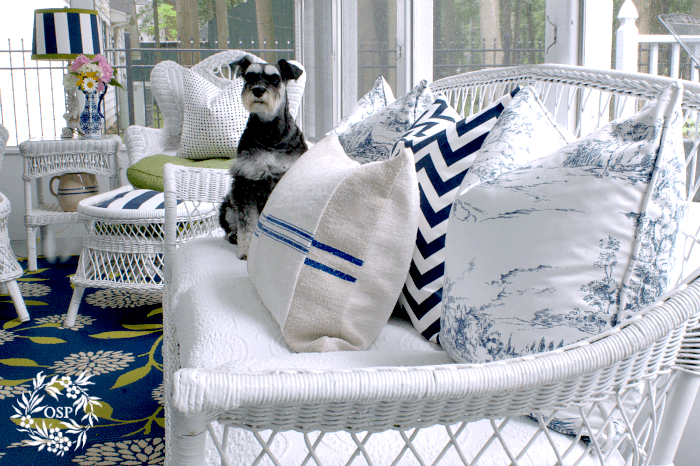 Blue and white is such a great color for a porch and I love your other pops of color. Well done Ann! Ann, your porch is lovely! I love that it’s your own space. (I guess your family hasn’t realized what they’re missing yet!) The rugs are great. I didn’t realize Lamps Plus even sold rugs! Your porch is so pretty. LOVE the color and design on the rugs. I don;t blame you for claiming if for yoursef. I love that rug! I’m with you…have to have blue in my home. I love all of the blue and white on your porch. It looks fresh and inviting for summer. I like everything on your porch … we must have similiar taste. And a porch to yourself … how dreamy. Gorgeous porch Ann!…just love that beautiful rug!!! Charming spot, love your bright and cheerful colors! Ann, I love your porch! So bright and cheery. Those rugs are beautiful and add just the right amount of pop. If I had a porch like that I would be out there all the time! I love the porch – I don’t worry about the rain either. I have a gazebo that is a little distance from the house so it is worth it to me to have a comfy place to sit – why worry about the rain?!??! I am going to give them a look! I am going to be needing a rug for my daughters room. Now, how can I get them to give me one??! ;) LOL! Ann, this is truly gorgeous and to have this space all to yourself is amazing!! I love everything you have done and that lamp on the table is great!! Your porch looks positively fresh and inviting!!! I love how your back porch looks! It’s so fresh and crisp. You’ve done a great job coordinating all the fabrics together too. I must say that the rugs are the best part. 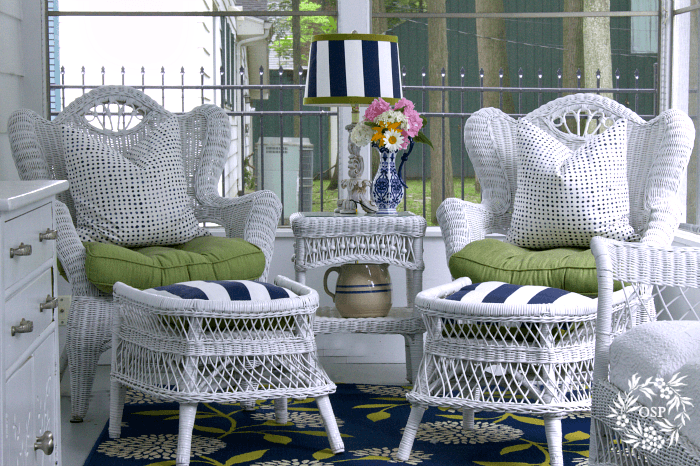 They really set the tone for the whole space and contrast so well with your white wicker. I would love to sit out there and relax too! It’s perfectly beautiful! I love the colors… the pillow fabric choices are just right with the rug and I love the glimpses of some great vintage accessories (like the sunflower bucket). It looks like a wonderful place to relax. Oh it is so beautiful, warm and inviting Ann. LOVE everything about it! I love that you really built your room around the rug and its colors. I’d also love to sit there and have a glass of iced tea with you Ann. Your porch looks wonderful! I love the greens and blues.